In the movies, there is usually a "good guy" and a "bad guy". Usually the good guy starts off appearing really strong. Then as the plot progresses, the bad guy increases in strength until the point comes where he seems utterly invincible. But in the end, that strength is always revealed to be nothing but a house of cards. The fight may be epic, but the good guy always wins. Usually the seemingly strong foe has a simple weakness that the good guy able to exploit rather easily once he figures it out. This is a lot like anxiety. It shouldn't be a surprise that the bad guy in this analogy is anxiety, and the good guy is you, the person struggling with anxiety. Anxiety usually comes on small, with just a little nervousness that can be easily dismissed as nothing to worry about. With time, though, it increases in it's intensity until it engulfs your life and your situation seems absolutely hopeless. The important thing to realize is that you are the good guy, and the good guy always wins in the end. The strength that you possess may not seem like a lot, but you have one major thing going for you. Your strength is real. It is grounded within you and cannot be taken away. The strength of your anxiety or panic may seem overwhelming. But it's not real. It's a house of cards that be blown away with the same breath that you'd use to blow out birthday candles on a cake. It's not real because anxiety has no real power. It relies 100% on YOUR power to fuel it's attacks. Anxiety comes totally from within. It's your brain, and your mind, and your body that are being used against you to cause you to panic. Once you realize this and you see the anxiety for the house of cards that it really is, all you have to do is blow and you'll watch it fall. It's a lot like Judo. Judo is a form of martial arts that focuses on using an opponents strength against them. You don't have to be strong to practice judo. Instead, you simply rely on the strength of your opponent. You just have to predict how your opponent is going to use their strength and divert it so that their own strength is used against them. This is what anxiety and panic are doing to you. They have no real strength of their own, so they trick you into using the considerable strength that you have on yourself. The harder you try to fight your panic, the more the panic wins and the worse your panic attack becomes. The winning strategy is to not play into what anxiety is leading you to do. It's predicting your attack, and it's waiting and ready to knock you on your back. All you have to do is what it does not expect: accept it. It will have no counter for this. This is much like instead of attacking when it is goading you, just put down your weapons and stand there. Realize that it is unable to attack you on it's own, because it lacks strength. If you stand there and wait, it will go away. Opposite Action- A great mindfulness technique for stopping panic dead in it’s tracks! Opposite Action is a term I see thrown around a lot lately and one that I find very interesting. I have been applying aspects of this for some time without even realizing that is what I was doing. I want to discuss opposite action here because it some great applications to anxiety and panic attacks. It’s really a very simple concept. When you begin to feel anxious, your first instinctual reaction is usually something very counter-productive. Your primal fight-or-flight response kicks in and your actions will often fuel the panic further. By consciously taking the opposite route you have a much better chance at reducing that anxious response before it blows up into a full blown panic attack. My number one panic trigger is interstate driving. I tend to get very anxious when driving on highways (although I absolutely love to travel. Ironic, huh?). When I start to get anxious while driving my first instincts are to turn down the radio, slow down and move into the slow lane, and get really fidgety. I start pulling on my seat-belt because the source of many of the physical symptoms of anxiety are in my chest and I feel constrained by the seat-belt. I will reach for the shifting handle even though my car has an automatic transmission. I drove a stick-shift for many years and I suppose that control gave me some comfort. My mind now associates all of these actions with previous panic attacks. When I start to go through these actions, it is just like going through my classic panic-attack checklist. I am taking the cues one by one. Once that last check mark is put down, panic goes to work. There really is no stopping it at that point. The flood gates break down and that wave of panic comes crushing down. By identifying these impulses and realizing that they come from the irrational part of my brain that controls panic I take first step to stopping that panic before it starts. I’ve learned to replace these impulses with consciously thought-out actions from a more rational part of my brain. On a recent road trip, I put this into action. Instead of turning the radio down, I turn it up and allow myself to focus more on the music, maybe change the track to something more positive. I resist the urge to fidget and become restless, instead becoming mindful of my body and allowing my muscles to relax. Instead of grabbing for the shifter or pulling on my seat-belt, I put my hands squarely on the steering wheel and keep them there. By doing this I have been able to stop the panic from progressing. I continued along on my drive with no further anxiety. 1. Acknowledge what you are feeling. 2. Identify what actions or reactions go with that feeling. 4. Figure out what the opposite action is. 5. Do that opposite action ALL THE WAY! I would recommend going through this analysis while in a calm state of mind so that you will be prepared with the appropriate opposite actions in advance of the onset of anxiety. You aren’t very likely to be thinking rationally when you are anxious. Opposite action can be applied to many things, not just anxiety. Often we put ourselves into positions where we become our own worst enemy. It may be possible to use this technique on a wide range of feelings or emotions that you want to rid yourself of but may be feeding without even realizing it.Try this approach sometime and see if it works for you! Best of luck! Quit Talking Yourself Into Fear! It probably sounds pretty simple, right? Duh! We don't enjoy feeling scared, anxious, or panicked so why would we talk ourselves into feeling this way? But the truth is that many of us do. Think about it. What usually happens just before (or often during) a panic attack? Negative thoughts. "What if..? Thoughts. "What if I do something embarrassing?" "What if I bomb this test?" "What if I forget the lines to my presentation, I lose the client, get fired from my job, my wife leaves me, my car gets repossessed, and I have to hold one of those signs saying "Cash 4 Gold" on the street corner?" Those negative, fearful thoughts fool your mind into thinking there really is something to fear, triggering a fight-or-flight response throughout your body. Your heart starts racing, your mind spins, and you spiral into the terrifying experience of a panic attack, and it all began with thoughts. Who created those thoughts? You did! In most instances, there is no legitimate outside force causing you to panic. Look back and reflect on the times that you have experienced panic attacks and ask yourself "what was the cause?". Sure, there probably was a trigger. Maybe it was a large crowd at the mall, or a traffic jam that you were stuck in. Maybe you had to get up and speak in front of a group. A stressful day at work. A tough conversation with someone you love. Different things trigger panic attacks for different people. But the root cause is always the same: You. It's your reaction to the situation that causes the panic. You feel anxiety brought on by the triggering situation, which is perfectly natural. It is what happens after that initial anxiety that becomes a big problem. You start to fear the anxiety. When the fear kicks in and you become afraid that you are going to panic, you do. This is all happening solely inside you. The external trigger no longer has anything to do with it. You are simply doing this to yourself. 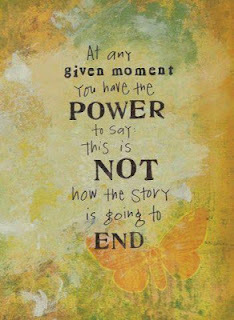 There is an awesome power that comes with realizing this. If you are the one causing yourself to panic, all you have to do is STOP! Stop feeding yourself negative thoughts. Replace them with positive ones. Take a deep breath, mentally step back and you'll realize that whatever is causing you to freak out is really nothing to worry about. Most of the time these triggers are things that we've done many times before, even once considered to be mundane. Unless you are actually being chased down by an angry bear, then you can give yourself permission to calm down. It's easier said than done, I understand. I have struggled with panic myself for years, and it's still tough at times. I'm not trying to minimize it, just simplify it. If you pull back and give yourself a wider perspective on the situation, you'll see that there's literally nothing to fear except for fear itself. So you have to give a big speech in front of a class. Think about the times you've had to do this in the past. You were likely nervous then too, but you got through it. Is it a major life event that you reflect upon regularly? Do you recall specifics of any of the speeches given by your other classmates? Probably not, and they probably don't remember yours either. If you were all sweaty and nervous or stumbled over your words, it wasn't printed in the history books yet. And this time will be no different. You will be nervous, but you will get through it. Life will go on. So quit beating yourself up, because it's just not that bad. Your worst "what if.." scenarios won't actually unfold. How many times have you actually seen someone freak out on a plane and run up and down the aisles at takeoff screaming their heads off? I have, but only in my head while I was sitting quietly in my seat with my eyes closed. They're just thoughts in your head. Most people don't act on them. You know those what ifs aren't actually going to happen. A good coping tool is to embrace them. If you're in line for a water slide and just petrified that you're going to embarrass yourself by chickening out and making the walk of shame back down all those stairs, then go with it. Imagine yourself just going absolutely looney toons, running down those stairs, arms in the air, screaming bloody murder, and knocking down little children left and right. Laugh it off and you'll feel a little better. By realizing that you are talking yourself into fear, you give yourself the power to stop it. The next time you are feeling anxious and those what if thoughts come around, shoo them away and try replacing them with good what ifs. What if I amaze them at this interview and get the job of my dreams? What if everything goes right on this road trip and I have the time of my life? Or even simply, "what if I just get through this and then go eat some Zebra Cakes afterward?" Think of all of the opportunities that can come to you when you rid yourself of that fear and start thinking about possibilities! Your panic attack cannot kill you. Of all the things I have learned, this is by far the most crucial. When you are in that moment of panic, your heart is racing, your mind is lost, you're having trouble breathing, and you may feel like you're going to die. When I had my first major panic attack, I thought I was about to die. I was literally saying my good-byes to the world as I paced back and forth in my bathroom at 5am. I awoke my wife, unsure if I was going to be saying good-bye to her forever or having her drive me to the ER. But upon waking (and scaring the Hell out of her) I was able to get some comfort and began to calm down. It soon passed and a state of confusion took over for the fear. I will get to that in another post. But, although I sure felt like this must be the end for me, it surely wasn't. This was years ago and I am still alive and kicking. Your panic attack simply does not have the ability to kill you. I will explain why. The panic attack is created entirely by you. It may seem to be triggered by outside factors, but really it is all coming from your amygdala, a primal part of your brain that controls feelings such at the fight-or-flight response. If you have an anxiety disorder, this fight-or-flight response is simply being misdirected. It is being triggered when it really isn't needed. This is what makes it so scary. If you stubbed your toe while going for a glass of water in the middle of the night, you would feel pain, but you wouldn't feel fear because you know the source of your pain is from the corner of that chair that was left where it shouldn't be. If you felt that same pain just now as you're sitting at your computer desk reading this, you'd be extremely alarmed. The reason is that you wouldn't know the source of the pain. The same is true with anxiety. If you feel scared while facing a legitimate threat, say you are facing an angry bear, you are going to feel anxiety and panic for sure. But it will be well placed. Your amygdala is giving you instinctual fuel to get yourself out of that dangerous situation quickly. You will flea and the panic and fear will leave you shortly after the threat is gone. But, in the case of an anxiety disorder, you are experiencing that same fight-or-flight response when there is no legitimate threat. This makes it all the more alarming. You don't have anywhere to direct this fight-or-flight. There is nothing to fight and there is nowhere for you to direct your flight. This perpertuates the fear. In the analogy of the bear, you would simply have learned to be afraid any time you saw a bear. In the anxiety case, your brain will simple place the same type of association with whatever stimulus is around at the time. If you were driving over a bridge when your panic attack hit you, your brain my end up putting a fear association with bridges and you may begin to feal anxiety when crossing bridges. That's the way these things work. It's important to understand why these associations are there in order to get past them. The panic attack is created entirely by your amygdala, a part of your brain. You have no direct control over the amygdala. You can only control the input that is directed towards it. If it recieves the signal for panic, it will act accordingly. You have the ability though to change how other parts of your brain operate in order to inhibit the signals of panic from being sent to the amygdala unneccessarily. This comes with a deep understanding of who you are and how you think. You have to change the negative thought patterns that are contributing to these false signals being sent over to that primal part of your brain. With an understanding of the amygdala comes the realization that it does not have the ability to destroy itself. The human body is not equipped with a "self-destruct" button. Have you ever played in the swimming pool to see which of your friends can hold their breath the longest? The overwhelming urge to return the surface will happen long before you really run out of life-sustaining oxygen. Sit now and try to stop your heart from beating. It cannot be done. Your amygdala is also responsible for this. It keeps your heart beating, your lungs breathing, and all of your other primary functions going. It also triggers that natural fight-or-flight response that becomes a panic attack when misdirected. It simply does not have the ability to end your life. The amygdala's primary function is to sustain your life. It is a very primal part of your brain and just does not have the option to do anything else. It can not destroy itself and thus it cannot destroy you. Having faith in this can go a long way to stopping that panic attack before it eats you alive. Acceptance is one of the most advocated methods for overcoming anxiety, and for good reason. Acceptance becomes a lot easier when you realize, with confidence, that there is an end. You will survive the panic attack. It will last no longer than 20 minutes, usually much shorter than that, and then your life will continue. If you tell yourself this, and truly believe it, when panic begins to set in you may find yourself just coasting on in peace. I vividly remember sitting on my bathroom floor, staring at the wall. The world was looking dark as can be. I was in the midst of a bout with a panic attack in my own home. Anxiety was tearing apart my life. I was essentially unable to leave home on my own without panicking. I wasn't eating right, or much at all. I wasn't sleeping well. I felt horrible about the toll this was taking on my relationship with my wife. I was depending on her for so much and that was not fair to her. I was positive that all of my career and life goals were now about as attainable as riding a dolphin to the moon. And I was quite sure that a normal life was surely beyond my reach. There didn't seem to be much point in anything.This was less than a year ago. It was at that point, while sitting on my bathroom floor, that something dawned on me. Something that would change my life forever. As I was trying to dig through the gloomy haze of panic and find something to drag me up off of that floor, I thought about the future. I realized it was still there. Despite all of the pain I could still not see there not being a future. And something occurred to me. It was the thought that if I could get through THIS, the most impossible challenge I have ever faced in life, nothing could stop me. If I can find the strength to get up off that floor and go on, what other obstacles could possibly be waiting out there for me that are going to be tougher than this? Is a day at work going to present challenges that I can't handle? Surely not, if I can get through this. I look at this day as the turning point in my battle with anxiety. I had hit my rock bottom. There wasn't anywhere left to go but up. I'd love to say that I just stood up, dusted myself off, and never looked back, but of course it wasn't that easy. There were bumps, hurdles, and setbacks all along the way and it was a slow and sometimes painful journey. But I've kept with it, and this vision of the future that came to on the floor that day has been what has gotten me through the hard times. I had resolved that I was going to see this through so that I could become the better, stronger person that I would never have been able to become without having this adversity put in my path. Now I am still on this journey. I still live with anxiety. But it doesn't hinder me in my everyday life any longer. It simply reminds me to take care of myself and keep on moving. It's not nearly as debilitating as it once was and I am well on my way to achieving those dreams that were hatched that day on the floor in my bathroom. I'm on the other side of things. "What if it were true that you weren't so blue? And you felt like you could just do anything? looks like it's rising, and we are on the other side of things." It's really a very simple concept. When you begin to feel anxious, your first instinctual reaction is usually something very counter-productive. Your primal fight-or-flight response kicks in and your actions will often fuel the panic further. By consciously taking the opposite route you have a much better chance at reducing that anxious response before it blows up into a full blown panic attack. By identifying these impulses and realizing that they come from the irrational part of my brain that controls panic I take first step to stopping that panic before it starts. I've learned to replace these impulses with consciously thought-out actions from a more rational part of my brain. On a recent road trip, I put this into action. Instead of turning the radio down, I turn it up and allow myself to focus more on the music, maybe change the track to something more positive. I resist the urge to fidget and become restless, instead becoming mindful of my body and allowing my muscles to relax. Instead of grabbing for the shifter or pulling on my seat-belt, I put my hands squarely on the steering wheel and keep them there. By doing this I have been able to stop the panic from progressing. I continued along on my drive with no further anxiety. 3. Ask yourself "do I want to stop or reduce this feeling?" I would recommend going through this analysis while in a calm state of mind so that you will be prepared with the appropriate opposite actions in advance of the onset of anxiety. You aren't very likely to be thinking rationally when you are anxious. Opposite action can be applied to many things, not just anxiety. Often we put ourselves into positions where we become our own worst enemy. It may be possible to use this technique on a wide range of feelings or emotions that you want to rid yourself of but may be feeding without even realizing it.Try this approach sometime and see if it works for you! Best ofluck! Often when something makes us uncomfortable or anxious, our first response is to retreat. It's a natural response, but often not a helpful one. Sometimes you really do have to face that fear. This is especially true for people with anxiety disorders, because what has us worked up is usually not jumping out of an airplane or staring down a man-eating shark. It's more likely to be something like driving during rush-hour traffic, standing in a long line at the grocery store, meeting someone new, or speaking in front of a group. If we allow ourselves to retreat from these everyday things because they make us anxious or even stir a panic attack, we allow our world to shrink. We avoid going out for fear of facing these things. The real problem is that the anxiety is within us. It is not out there in the cold cruel world that we are retreating from. So when we hide at home or avoid stressful places, eventually we find that the anxiety is still right there with us. It still finds a way to come out. Then we begin finding new triggers and new things to avoid. Our worlds continue to shrink, and this viscious cycle can cause more stress and more anxiety. This is where old Mr. Churchill's words of wisdom come into play. We've seen that freedom from anxiety does not lie in retreating. You're going through Hell so the last thing that you want to do is stop and just stay where you are. So you're left with one option, keep going. Move forward until you're out of the flames.